The International House of Chicago is a dormitory on the campus of the University of Chicago for advanced undergraduates, graduate and professional students. Facing the Midway, it was created in 1932 as a gift from John D. Rockefeller, Jr. specifically to foster relationships between students from different countries. It is notable for having housed many famous artists, scientists, and scholars connected with the university, including Langston Hughes and Enrico Fermi. Some 30,000 people have lived there since it first opened its doors. An attempt in early 2000 by the University of Chicago administration to close the International House and convert it into a dormitory for the Business School resulted in large student protests and a class-action lawsuit against the university by International House residents. After months of negative media attention and intense public criticism by faculty, alumni, and local activists, the administration finally reversed its decision and allowed the International House to remain open. The International House subsequently embarked on a $30 million renovation project. International House of Chicago, founded in 1932 by John D. Rockefeller, Jr. is a dynamic program center and residence capable of housing up to 486 advanced undergraduates, graduate students and interns from around the world, including the United States. The mission of International House is to promote cross-cultural understanding, mutual respect and friendship among students and scholars and on the part of the people of metropolitan Chicago toward individuals of all nations and backgrounds. Chicago’s International House is part of a larger vision conceived by YMCA official Harry Edmonds that included Houses in four other cities – New York, Berkeley, Paris and Tokyo. Today the vision of International House is a vital reality. The Chicago House has been home to over 27,000 persons from virtually every country. Living together in an atmosphere that provides for free interchange of ideas and knowledge, its residents are stimulated by diversity while being secure in their own unique backgrounds. International House is in the final stages of a multi-year $30 million restoration which has modernized resident and guest accommodations as well as updated meeting, conference and public event spaces to serve future generations of students, scholars and the Chicago community. The House serves the greater Chicago community as a cultural center for programs of outstanding diversity. Activities range from politics and international films, to dance and music, from cultural celebrations and educational programs to discussions and debates on world issues. As we begin a new century, International House of Chicago plays a vital role in preparing tomorrow’s leaders for a global future. This book was an excellent mystery. It focuses around Geneva Anderson who lives in International House and has a fellowship to write poetry. Her Aunt, Victoria Franklin, is the administrator of International House, and when Geneva finds her dead in her office, it is clear that there has been foul play. What Geneva never expects is that her inheritance from her aunt will leave her a millionare, reveal that she has a sister, and make her the prime suspect in the murder investigation involving her aunt’s death. Against the advice of her friends, she decides she needs to do some research of her own to try and clear her name. The more research she does, the more she realizes what kind of woman her aunt really was, and also realizes she has numerous enemies who would have been happy to see her dead. This was a fast paced mystery that really held my interest. At 209 pages it was a quick read and I was unable to figure out who the true killer was until just before it was revealed, something I love in a book as I am usually very good at guessing the ends. There were numerous twists and turns that will keep the attention of any mystery buff. Determined, personable, and imaginative are the words used to describe, Bernadette Steele. Throughout her life, Bernadette has used her persistent nature and quiet strength to navigate the hills and valleys of life. A native of Chicago, Illinois, Bernadette moved into the International House at the University of Chicago in 2004. The multicultural environment and gothic architecture of I-House and the U of C campus inspired her to write her first murder mystery novel, The Poetry of Murder (Oak Tree Press, February 2008). Due to a difficult childhood, Bernadette did not finish the sixth grade and never attended high school. She earned her Bachelor of Arts degree in English from the University of Illinois at Chicago in 1993 and her Master of Science degree in Technical Communication and Information Design from the Illinois Institute of Technology (IIT) in 2003. Currently, she is pursuing her PhD in Technical Communication at IIT and has an expected graduation date of 2010. She plans to pursue a career in academia. For eight years, Bernadette worked as a technical writing and website designer for a major financial institution until she was laid off in December 2005. Prior to being laid off, Bernadette started writing The Poetry of Murder, and finished it in 2006. As a resident of I-House, she served as a Representative-at-Large on the Residents’ Council from 2004 to 2006 and as the election coordinator in 2006. She approaches her writing in a systematic manner that involves developing detailed outlines and character descriptions. Some of Bernadette’s favorite authors include Walter Mosley, James Baldwin, Agatha Christie, and Victor Hugo. Bernadette has been an active member of the Alpha Kappa Alpha Sorority since 1999. She has served as her chapter’s webmaster from 2004 to 2007 and as a corresponding secretary from 2004 to 2005. Bernadette enjoys a host of activities such as going to the movies, hiking and traveling. Her favorite film genres include film noir, science fiction, action/adventure and murder mysteries. For Bernadette, the seasons are divided up according to the various sporting events that she enjoys. Fall and Winter mean hoping that the Chicago Bears will get a decent quarterback and that the Chicago Bulls will get to the NBA championships again. Summer and Spring mean rooting for James Blake to win a championship tennis match and watching Tiger Woods have a winning season of golf. 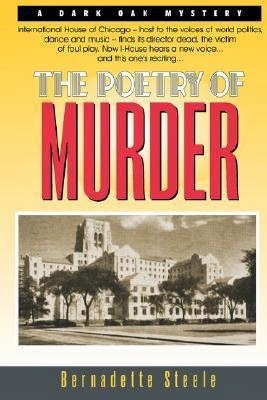 The Poetry of Murder is the first in a continuing series of mysteries featuring the protagonist, Geneva Anderson. Bernadette is a resident of Chicago and lives in the Hyde Park community. There is the nice scheme of the poetry where you can catch the nice scheme. Make the better review with this angle and you can check this link right here now in the right middle corner of the edge where you can see the better dealing area. You can come to this place and can enjoy the new section of the poetry here. You can also get the best author services here and can try this site in order to sustain the better position of your world here. A place of the poetry where you can make the new choice with the better time of the new standards. You can enjoy the great phase of the time here with this website and can enjoy the new author services in this place. Great site, This truly matters for an amazing span and you need to pick it with the true blue way. Now you can read what he said which will helpful to the students. Truly, I content with my activity and I advantage however much as could reasonably be expected from my field so unprecedented. Poetry is the language of feeling. Every poet should shape feelings and thoughts into words and here I found the best ways to putting our feelings into words though Bernadette steele. In https://www.rephraser.net/our-rephrase-sentence-online/rephrase-a-paragraph-service we will be able to rephrase our sentences.